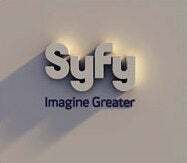 The Sci Fi Channel wants to change its image, by misspelling its own name as "Syfy" — apparently the "y" stands for "Yurgh, terrible idea." Also, don't get too comfortable with the old Saturn logo, because that's getting the boot as well.The channel's new tag line will be "imagine greater," and the changes could roll out as soon as July 7th. The rebranding will debut in front of advertisers today. Maybe I fear change too much, but will this tweak really expand the possibilities of a channel that already runs a schedule full of whatever they loosely call science fiction? I never felt that the channel was every truly limited by a need to broadcast actual SF, so I'm not really sure what'll change with the title.